RM4SCC is a linear postal barcode symbology used by the Royal Mail for Cleanmail service. It is also known as CBC (Customer Bar Code) within Royal Mail. RasterEdge Barcode Creator Library Plug-in, a consisting DLL of DocImage SDK for .NET, is a .NET control developed for barcode writing in C#.NET applications. Users can use this barcode generator to print RM4SCC barcode on image files such png, jpeg, gif, and bmp images, along with documents like PDF, Microsoft Office Word (docx file), Excel, PowerPoint and (multi-page) TIFF. Free to adjust various RM4SCC parameters such as resolution, orientation, color, text font, etc. You can easily generator RM4SCC barcode and save it to image files/object using this C#.NET barcode generator control. 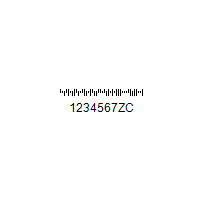 The following steps will show how to create a RM4SCC type barcode encoding numeric data text "1234567ZC" into the image object with XImage.Barcode.Creator. Please copy the sample code as follow to generator a RM4SCC barcode. This C#.NET barcode generating control enables developers to write and print a RM4SCC bar code on a png, gif, jpeg or bmp image file. To get it started, you can simply open your MS Visual Studio and create a new C#.NET imaging project, such as a Windows application, and then add the RasterEdge.Imaging.Barcode.Creator.dll to your project reference. Now you can copy the C# sample codes to your program to draw a RM4SCC barcode on a sample png image! This barcode generator add-on component for C#.NET can also help users draw a RM4SCC on a commonly used document, like PDF, (multi-page) TIFF, Microsoft Office Word, Excel and PPT. You can decide which page you want to put the barcode on, and which area you want to paint it. In addition, you can have full control over RM4SCC barcode settings, like size, color, rotation, resolution, UOM, and so on. Please refer to the parameter section for more details. The C# code below contains all the parameters mentioned above. Please use it to customize barcode properties so that you can generate a desired RM4SCC on a image or document file.